Michael Ruddy's early opener for Ards was cancelled out by James Doyle's solo effort for Crumlin Star. Ards regained the lead through David McAllister before Star were reduced to 10 men when Joe McNeill was shown a straight red card just before half-time. Ards made sure of their place in the last 16 in the second-half with goals from captain Gareth Thomas and a 73rd minute penalty by Ruddy. Crumlin missed a chance to get back into the tie when Kevin Trainor's spot-kick was saved by Sam Johnston. Sean Noble's seventh-minute opener for the Mallards was cancelled out at the start of the second half when Immaculata's Brian McCaul scored with a low free-kick. Two goals from Ryan Curran and an own-goal by Immaculata defender Sean McGovern put the Mallards in control before Kevin McGovern got a consolation goal for the visitors. Defender Kyle Owens continues his recent run of goalscoring form by slotting home from close range after 13 minutes. Matthew Shevlin doubles the Sky Blues' lead on 28 minutes, firing under the goalkeeper to round off a nice move. Tony Kane fires into an unguarded net from 40 yards to put United three goals ahead on 51 minutes after a poor clearance from goalkeeper Farniok had fallen to the midfielder. Shevlin adds his second of the game for Ballymena after Kevin Braniff's effort had been kept out. A Bobby Burns overhead kick from 10 yards gives Glenavon the lead just before half-time but Carrick get level in the second half through a Mark Surgenor penalty. Glenavon move back in front four minutes before the end of the first period of extra time as James Singleton heads home from a Sammy Clingan corner before Surgenor's afternoon takes a turn for the worse as the Carrick skipper is sent off for a second yellow card. Andrew Mitchell secures the 2016 cup winners' place in the next round in the closing minutes after being set up by debutant Stephen Murray. Martin Murray has put Warrenpoint Town into the lead with a curling shot into the top corner in the sixth minute at Solitude. Cliftonville equalise before the break when centre-back Jamie Harney shoots into the bottom the corner and then take the lead early in the second half through Ross Lavery's follow-up tap-in. 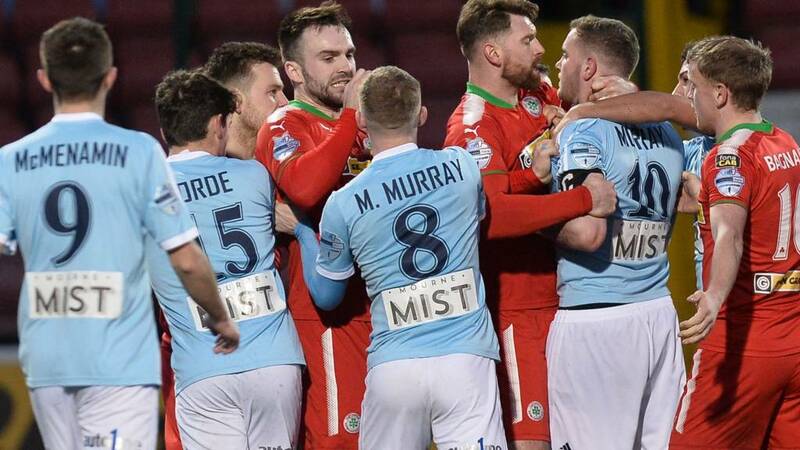 Jamie McGovern of Cliftonville is sent off on 66 minutes after clashing with Warrenpoint striker and Solitude old boy Darren Murray. Martin Murray grabs an equaliser with four minutes left - with Cliftonville appealing in vain for an offside decision. Warrenpoint manager Matthew Tipton, on as a late substitute, is sent off for a shocking tackle. It's his second yellow a matter of minutes and the last action of normal time. The Reds go in front 10 minutes into extra-time with Harney nodding in from a free-kick and the defender completes an unlikely hat-trick with a low shot into the bottom corner. Warrenpoint pull one back as substitute Darius Roohi fires in after good work from Lorcan Forde but Cliftonville hold on to clinch a thrilling victory. Premiership side Coleraine are leading thanks to an early goal by Gareth McConaghie. Darren McCauley's corner went right across face of goal to back post where it was bundled home from close-range by defender McConaghie. Stephen Dooley marks his return to Coleraine colours by heading home Josh Carson's cross in the 28th minute to double the Bannsiders' advantage. Jamie McGonigle converts from close range after Eoin Bradley's effort comes off the post to put Oran Kearney's men three goals clear. There's no let-up for the Premier Intermediate League side in the second half as Martin Smith adds an impressive fourth goal. Ian Parkhill becomes Coleraine's fifth different goalscorer when he fires home from the edge of the penalty area on 58 minutes. Substitute Matthew Kirk scores a sixth goal with a sweeping right foot shot on 72 minutes and the same player compounds Distillery's misery by scoring Coleraine's seventh late on. It takes Crusaders just 70 seconds to hit the front at Seaview as Jordan Forsythe lifts the ball over visiting keeper Conor Brady. Intermediate side Maiden City keep the Crues at bay until David Cushley's left-foot volley makes it 2-0 late in the second half and that's how it finishes on the Shore Road. Skipper Ryan Harpur gets on the end of a Mark Patton cross to put the Premiership side ahead in the opening two minutes. Kris Lowe marks his birthday by scoring to double the Tyrone side's lead four minutes before the break, with Patton again providing the assist. Johnny Lafferty scores a third goal in the opening minutes of the second period to put the Swifts in a comfortable position. Harpur, Dungannon's leading scorer, adds his second and the Swifts' fourth after Limavady keeper Paul Wells had kept out Paul McElroy's shot on 78 minutes. Championship Player of the Month Darren Stuart puts Larne ahead on 72 minutes as Dergview's resistance is eventually broken after a sustained spell of pressure from the home side. Ralph Kottoy adds a second goal soon after and Stuart doubles his account for the afternoon late on as the Inver Park side eventually cruise into the sixth round. The holders finally make the breakthrough against a stubborn Glebe side and it's a classy finish from Kirk Millar on 31 minutes. The substitute, who replaced the injured Jordan Stewart, curls the ball into the top corner from 20 yards. Mark Haughey nods in at the back-post to make it 2-0 early in the second half and Josh Robinson adds a third with a header before Matthew Clarke rifles home on the hour mark. Millar makes it five late on as he again finds the top corner thanks to a superb strike with the outside of his foot. Achille Campion and Kurtis Byrne made their Linfield debuts in the comfortable Windsor Park win. PSNI took the lead in the 28th minute after Lukasz Adamcyk converted from the penalty spot but goals from Peter Campbell and Nathaniel Ferris within the space of two minutes put Loughgall ahead at the break. Conor Mullen scored a third for the hosts before Campbell guaranteed the hosts a place in the next round in 86th minute. Keith Johnson makes the breakthrough for Newry in the 67th minute and he completes his double with 12 minutes remaining. City secure victory in the all-Championship encounter. Centre-back Adam McCallum crashes in the opening goal to give Portadown the lead in the all-Championship clash at Shamrock Park. Things get worse for the Comrades as they have Sammy McIlveen sent off before half-time for a studs-up tackle on Andy Kilmartin. The Comrades, despite being a man down, equalise through striker Stewart Nixon. Fra Brennan of Portadowjn is sent off just before the end of normal time. That means 10 men v 10 in extra-time and Nixon wins it for the Comrades with 90 second remaining. Institute are the first scorers in the fifth round - Gareth Brown fires home the opener at Breda Park on seven minutes. It's followed by an Aaron Harkin penalty eight minutes from the break. No further goals in the second half so the Championship leaders progress to the last 16. The Premiership visitors go in front at Knockramer Park after 14 minutes with Curtis Allen netting for the Glens. Lurgan Celtic's Brian Toland sends a clearance into his own net to double the advantage. The side sitting bottom of the Championship pull one back in the final minute through Aaron Rodgers but the 22-times winners of the Irish Cup prevail. Jordan Morrison's goal gives Dundela a 23rd-minute lead at Queen's Playing Fields. And that's how it finished with the east Belfast side securing a place a place in the sixth round.